Last November, when news of Fred Sanger‘s death was making its way around scientific circles, so too were many images of Sanger DNA sequencing reactions visualized as autoradiograms. These images brought back memories of a style of Sanger sequencing gel that I first saw in an undergraduate class on population genetics taught by Charles (“Chip”) Aquadro at Cornell University in the autumn of 1994, which left a deep impression on me. My personal photograph 51, if you will. At the time, I was on course to be a high-school biology teacher, a plan that was scuppered by being introduced to the then-emerging field of molecular population genetics covered in Aquadro’s class. I distinctly remember Aquadro putting up a transparency on the overhead showing an image of a Sanger gel where each of the four bases were run in sets that included each individual in the sample, allowing single nucleotide polymorphisms (“SNPs”) to be easily identified by eye. This image made an extremely strong impression on me, transforming the abstract A and a alleles typically discussed in population genetics into concrete molecular entities. Together with the rest of the material in Aquadro’s class, this image convinced me to pursue a career in evolutionary genetics. Multi-sample Sanger sequencing gel of a fragment of the Drosophila melanogaster rosy (Xdh) gene (credit: Charles Aquadro). The first four lanes represent the four bases of the “reference” sequence, followed by four sets of lanes (one for each base) containing sequencing reactions for each individual in the sample. Notice how when a band is missing from a set for one individual, it is present in a different set for that same individual. This format allowed the position and identity of variable sites in a sample to be identified quickly, without having to read off the complete sequence for each individual. For those of us who now perform multi-sample SNP calling at the whole-genome scale using something like a Illumina->BWA->SAMtools pipeline, it is sometimes hard to comprehend how far things have progressed technologically in the last 20 years. Perhaps equally dramatic are the changes in the larger social and scientific value placed on the use of sequence analysis and the identification of variation in natural populations. At that time, the Aquadro lab was referred to in a friendly, if somewhat disparaging, way as the “Sequence and Think Lab” by others in the department (because “all they do in that lab is sequence and think”). As the identification of natural molecular variation in humans quickly becomes the basis for personalized medicine, and as next-generation sequencing is incorporated into more basic molecular biological techniques, it is impressive to see how quickly the “sequence and think” model has moved from a peripheral to a central role in modern biology. 30 years ago today, the “struggle to measure genetic variation” in natural populations was finally won. In a paper entitled “Nucleotide polymorphism at the alcohol dehydrogenase locus of Drosophila melanogaster” (published on 4 Aug 1983), Martin Kreitman reported the first effort to use DNA sequencing to study genetic variation at the ultimate level of resolution possible. Kreitman (1983) was instantly recognized as a major advance and became a textbook example in population genetics by the end of the 1980s. 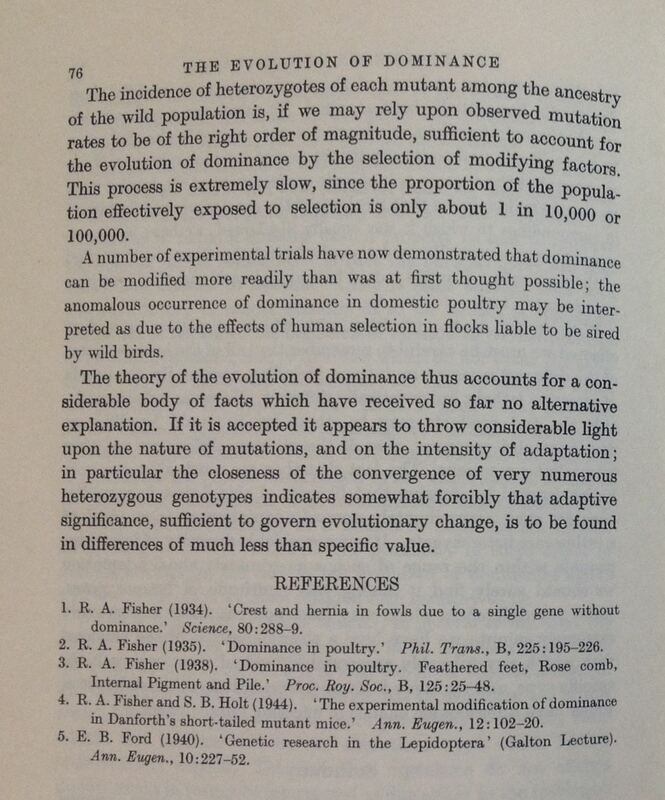 John Gillespie refers to this paper as “a milestone in evolutionary genetics“. Jeff Powell in his brief history of molecular population genetics goes so far as to say “It would be difficult to overestimate the importance of this paper”. Arguably, the importance of Kreitman (1983) is greater now than ever, in that it provides both the technical and conceptual foundations for the modern gold rush in population genomics, including important global initiatives such as the 1000 Genomes Project. However, I suspect this paper is less well know to the increasing number of researchers who have come to studying molecular variation from routes other than through a training in population genetics. For those not familiar with this landmark paper, it is worth taking the time to read it or Nathan Pearson‘s excellent summary over on Genomena. As with other landmark scientific efforts, I am intrigued by how such projects and papers come together. Powell’s “brief history” describes how Kreitman arrived at using DNA to study variation in Adh, including some direct quotes from Kreitman (p. 145). However, this account leaves out an interesting story about the publication of this paper that I had heard bits and pieces of over time. Hard as it may be to imagine in today’s post-genomic sequence-everything world, using DNA sequencing to study genetic variation in natural populations was not immediately recognized as being of fundamental importance, at least by the editors of Nature where it was ultimately published. I am delighted that you are commemorating Marty’s 1983 paper that changed the whole face of experimental population genetics. The story of the paper is as follows. It was always the policy in our lab group that graduate students invented their own theses. My view was (and still is) that someone who cannot come up with an idea for a research program and a plan for carrying it out should not be a graduate student. Marty is a wonderful example of what a graduate student can do without being told what to do by his or her professor. Marty came to us from a zoology background and one day not very long after he became a member of the group he came to me and asked how I would feel about his investigating the genetic variation in Drosophila populations by looking at DNA sequence variation rather than the usual molecular method of looking at proteins which then occupied our lab. My sole contribution to Marty’s proposal was to say “It sounds like a great idea.” I had never thought of the idea before but it became immediately obvious to me that it was a marvelous idea. So Marty went over on his own initiative, to Wally Gilbert’s lab and learned all the methodology from George Church who was then in the Gilbert lab. After Marty’s work was finished and he was to get his degree, he wrote a paper based on his thesis and, with my encouragement, sent the paper to Nature. He offered to make me a co-author, but I refused on long-standing principle. Since the idea and the work were entirely his, he was the sole author, a policy that was general in our group. I had no doubt that it was the most important work done in experimental population genetics in many years and Nature was an obvious choice for this pathbreaking work. The paper was soon returned by the Editor saying that they were not interested because they already had so many papers that gave the DNA sequence of various genes that they really did not want yet another one! Obviously they missed the point. My immediate reaction was to have Marty send the paper to a leading influential British Drosophila geneticist who would obviously understand its importance, asking him to retransmit the paper to Nature with his recommendation. He did so and the Editor of Nature then accepted it for publication. The rest is history. Our own lab very quickly converted from protein electrophoresis to DNA sequencing, and I spent a lot of time using and updating the computer interface with the gel reading process, starting from Marty’s original programs for reading gels and outputting sequences. We never went back to protein electrophoresis. 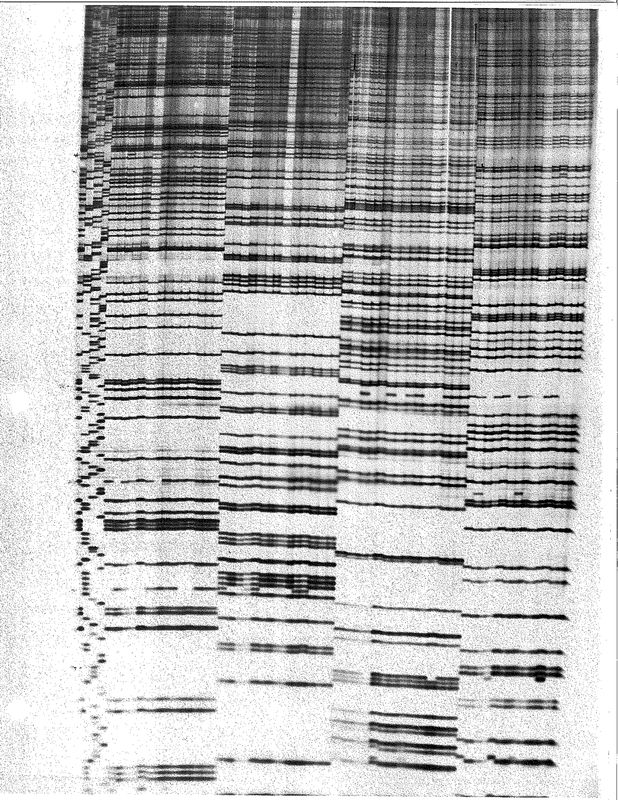 While protein gel electrophoresis certainly revolutionized population genetics, Marty’s introduction of DNA sequencing as the method for evolutionary genetic investigation of population genetic issues was a much more powerful one and made possible the testing of a variety of evolutionary questions for which protein gel electrophoresis was inadequate. Marty deserves to be considered as one of the major developers of evolutionary and population genetics studies. Some may argue that Kreitman (1983) did not reveal all forms of genetic variation at the molecular level (e.g. large-scale structural variants) and therefore does not truly represent the “end” of the struggle to measure variation. What is clear, however, is that Kreitman (1983) does indeed represent the beginning of the “struggle to interpret genetic variation” at the fundamental genetic level, a struggle that may ultimately take longer then measuring variation itself. According to Maynard Olson interpreting (human) genomic variation will be a multi-generational effort “like building the European cathedrals“. 30 years in, Olson’s assessment is proving to be remarkably accurate. Here’s to Kreitman (1983) for laying the first stone! Calvin Bridges (1889-1938) is perhaps best known as one of the original Drosophila geneticists in world. As an original member of Thomas Hunt Morgan’s Fly Room at Columbia University, Bridges made fundamental contributions to classical genetics, notably contributing the first paper ever published in the journal Genetics. The historical record on Bridges is scant, since Morgan and Alfred Sturtevant destroyed Bridges’ papers after his death to preserve the name of their dear friend whose politics and attitudes to free love were radical in many ways. Morgan’s biographical memoir of Bridges presented to the National Academy of Sciences in 1940 contains very little detail on Bridges’ life, and this historical black hole has piqued my curiosity for some time. Recently, I stumbled across a listing in the New York Times for an exhibit in Brooklyn recreating the original Columbia Fly Room, which will be used as a set in an upcoming film of the same name directed by Alexis Gambis. Gambis’ film approaches the Fly Room from the perspective of a visit to the lab by one of Bridges children, Betsy Bridges. I recommend other Drosophila enthusiasts to check out The Fly Room website and follow @theflyroom and @alexisgambis on Twitter for updates about the project. In digging around more about this project, I found a link to the Kickstarter page that was used to raise funds for the film. This page includes an amazing story about Bridges that I had never heard about previously. 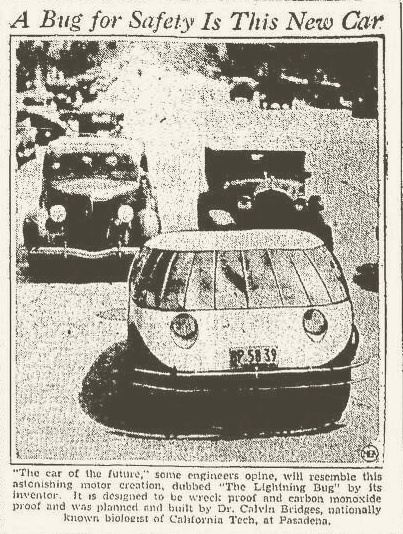 Apparently, after Morgan and his group moved to Caltech in 1928, Bridges built from scratch a futuristic car of his own design called “The Lightening Bug”. This initially came a big surprise to me, but on reflection it is in keeping with Bridge’s role as the main technical innovator for the original Drosophila group. For example, Bridges introduced the binocular dissecting scope, the etherizer, the controlled temperature incubator, and agar-based fly food into the Drosophilist’s toolkit. Coverage of Calvin Bridge’s Lightning Bug in Modern Mechanix (Aug 1936). Newshawks discovered that for months, when he got tired of looking at fruit flies, the geneticist had retired to a garage, put on a greasy jumper and worked on his car far into the night, hammering, welding, machining parts on a lathe. Now & then, the foreman reported, Dr. Bridges hit his thumb with a hammer. Once he had to visit a hospital to have removed some tiny bits of steel which flew into his eyes. It was Calvin Bridges’ splendid eyesight which first attracted Dr. Morgan’s interest in him when Bridges was a shaggy, enthusiastic student at Columbia. Calvin Bridges next to the Lightening Bug (Time Magazine, 4 May 1936). Gambis has also posted a video of the Lightening Bug being driven by Bridges taken by Pathé News. Gambis estimates this clip was from around 1938, but it is probably from 1936/7 since Bridges died in Dec 1938 and by the time Ed Novitski started graduate school at CalTech in the autumn of 1938 Bridges was terminally ill, but appears fit in this clip. This clip clearly shows the design of Bridges’ Lightening Bug was years ahead of its time in comparison to the other cars in the background. I also would wager this is the only video footage in existence of Calvin Bridges. 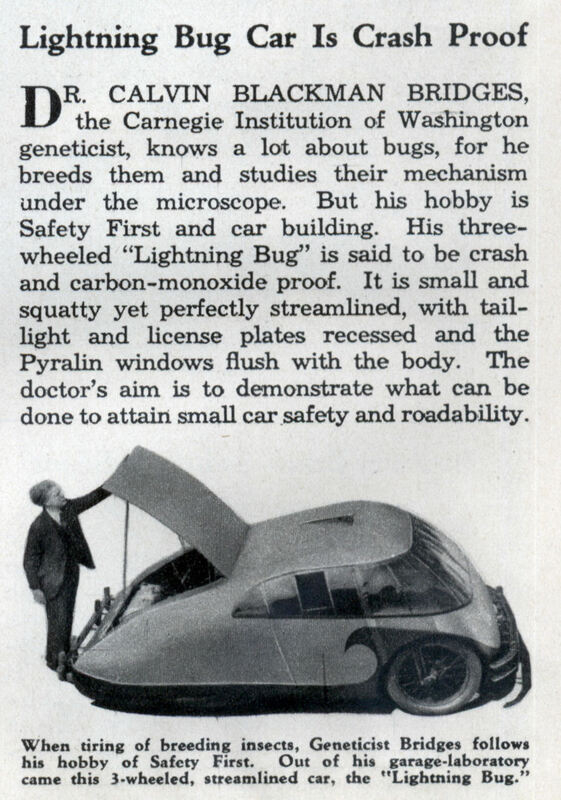 So there you have it: Calvin Bridges, Drosophila geneticist, was also an unsung automotive pioneer whose foray into designing futuristic cars was likely funded in part by the proceeds of the 1933 Nobel Prize! Seeing the #AAASmtg hashtag flowing on my twitter stream over the last few days reminded my that my former post-doc advisor Sue Celniker must be enjoying her well-deserved election to the American Association for the Advancement of Science (AAAS). Sue has made a number of major contributions to Drosophila genomics, and I personally owe her for the chance to spend my journeyman years with her and so many other talented people in the Berkeley Drosophila Genome Project. I even would go so far as to say that it was Sue’s 1995 paper with Ed Lewis on the “Complete sequence of the bithorax complex of Drosophila” that first got me interested in “genomics.” I remember being completely in awe of the Genbank accession from this paper which was over 300,000 bp long! Man, this had to be the future. (In fact the accession number for the BX-C region, U31961, is etched in my brain like some telephone numbers from my childhood.) By the time I arrived at BDGP in 2001, the sequencing of the BX-C was already ancient history, as was the directed sequencing strategy used for this project. These rapid changes made discovery of a set of discarded propaganda posters collecting dust in Reed George’s office that were made at the time (circa 1993) extolling the virtues of “Directed Genome Sequencing” as the key to “Deciphering the Fabric of Life” all the more poignant. I dug a photo I took of one of these posters today to commemerate the recognition of this pioneering effort (below). Here’s to a bygone era, and hats off to pioneers like Sue who paved the road for the rest of us in (Drosophila) genomics! Over the last year or so, I have become increasingly interested in understanding the origin of major concepts in genetics and molecular biology. This is driven by several motivating factors, primarily to cure my ignorance/satisfy my curiosity but also to be able to answer student queries more authoritatively and unearth unsolved questions in biology. One of the more interesting stories I have stumbled across relates to why so many terms in molecular biology (e.g. codon, replicon, exon, intron, transposon, etc.) end with the suffix “-on”? While nowhere as pervasive the “-ome” suffix that has contaminated biological parlance of late, the suffix “-on” has clearly left its mark in some of the most frequently used terms the lexicon of molecular biology. To mark this new view of the gene, Seymour invented new terms for the now different units of mutation, recombination and function. As he was a physicist, he modelled his terms on those of physics and just as electrons, protons and neutrons replaced the once indivisible atom, so genes came to be composed of mutons, recons and cistrons. The the unit of function, the cistron was based on the cis–trans complementation test, of which only the trans part is usually done…Of these terms, only cistron came to be widely used. It is conjectured that the other two, the muton and the recon, disappeared because Seymour failed to follow the first rule for inventing new words, which is to check what they may mean in other languages…Seymour’s pioneering invention of units was followed by a spate of other new names not all of which will survive. One that seems to have taken root is codon, which I invented in 1957; and the terms intron and exon, coined by Walter Gilbert, are certain to survive as well. Operon is moot; it is still frequently used in prokaryotic genetics but as the weight of research shifts to eukaryotes, which do not have such units of regulation, it may be lost. Replicon, invented by Francis Jacob and myself in 1962, seems also to have survived, despite the fact that we paid insufficient attention to how it sounded in other languages. Thus, the fact that many molecular biological terms end in “-on” (initiated by Benzer) owes its origin to patterns of nomenclature in chemistry/nuclear physics (which itself began with Stoney’s proposal of the term electron in 1894) and the desire to identify “fundamental units” of biological structure and function. While Brenner’s commentary provides a crucial first-hand account to understand the origin of these terms, it does not provide any primary references concerning the coining of these terms. So I’ve spent some time digging out the original usage for a number of more common molecular biology “-ons”, which I thought many be of use or interest to others. I have not been able to find a definitive first reference that defines the term codon the fundamental unit of the genetic code. According to Brenner (1996)  and US National Library of Medicine’s Profiles in Science webpage on Marshall Nirenberg , the term codon was introduced by Brenner in 1957 “to describe the fundamental units engaged in protein synthesis, even though the units had yet to be fully determined. Francis Crick popularized the term in 1959. After 1962, Nirenberg began to use “codon” to characterize the three-letter RNA code words” . So there you have it, from electron to retrotransposon in just a few steps. I’ve left out some lesser used terms with this suffix for the moment (e.g. regulon, stimulon, modulon), so as not to let this post go -on and -on. If anyone has any major terms to add here or corrections to my reading of the tea leaves, please let me know in the comments below. Brenner, S. (1995) “Loose end: Molecular biology by numbers… one.” Current Biology 5(8): 964. The Marshall W. Nirenberg Papers. http://profiles.nlm.nih.gov/ps/retrieve/Narrative/JJ/p-nid/23. Jacob, F., et al. (1960) “L’opéron: groupe de gènes à expression coordonnée par un opérateur.” C.R. Acad. Sci. Paris 250: 1727-1729. Jacob, F., and S. Brenner. (1963) “Sur la regulation de la synthese du DNA chez les bacteries: l’hypothese du replicon.” C. R. Acad. Sci 246: 298-300. Gilbert, W. (1978) “Why genes in pieces?.” Nature 271(5645): 501. Hedges, R. W., and A. E. Jacob. (1974) “Transposition of ampicillin resistance from RP4 to other replicons.” Molecular and General Genetics MGG 132(1): 31-40. Boeke, J.D., et al. (1985) “Ty elements transpose through an RNA intermediate.” Cell 40(3): 491. Jim Shapiro (University of Chicago) gave very helpful pointers to possible places where the term “transposon” might have originally have been introduced.